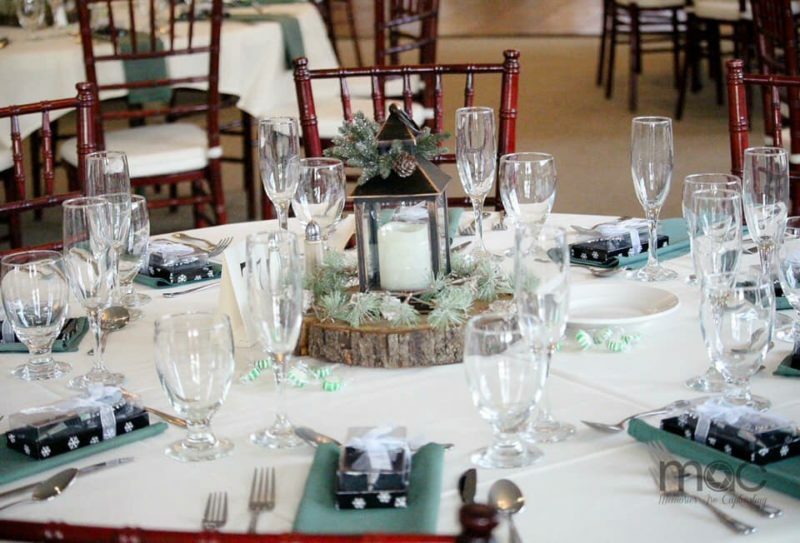 Ashley & Jonathan had a beautiful winter wedding completely with lantern centerpieces, forest green napkins and gold and wood accents. After their church ceremony, the new Mr. & Mrs. Boyle along with their bridal party and guests, joined us for cocktail hour and their reception in our Bliss Ballroom. 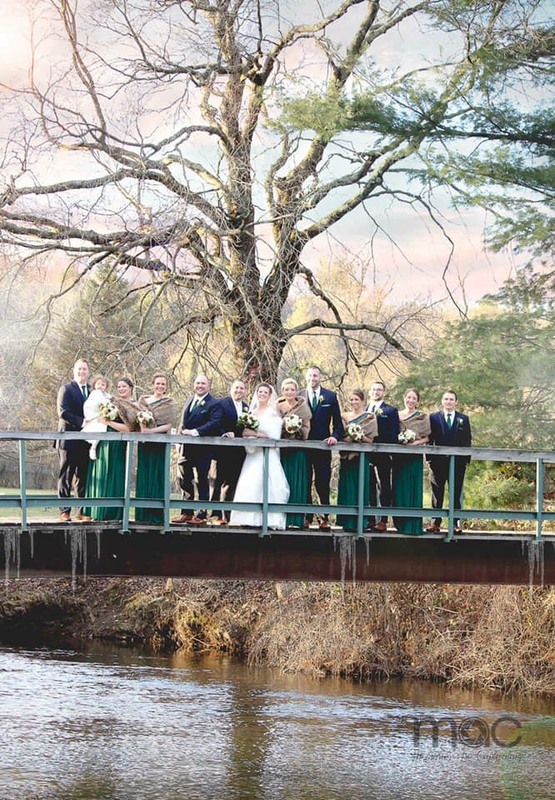 The bridal party braved the cold weather and got amazing pictures our bridge and scenic golf course. The couples signature drink was a new spin on an old favorite, “The Red Nosed Reindeer” mimicked a traditional Shirley Temple with Vodka. We enjoyed sharing not only their wedding day, but this couples rehearsal dinner with us the night before in our Azalea Room. Thank you so much to Mr. & Mrs. Boyle and their friends and family for an amazing time! We ended our wedding season with Kaitlyn and Marks New Years Eve wedding and went out with a bang! This fun couple had their ceremony, cocktail hour and reception in our Bliss Ballroom, surrounded by 135 of their closest friends and family members. 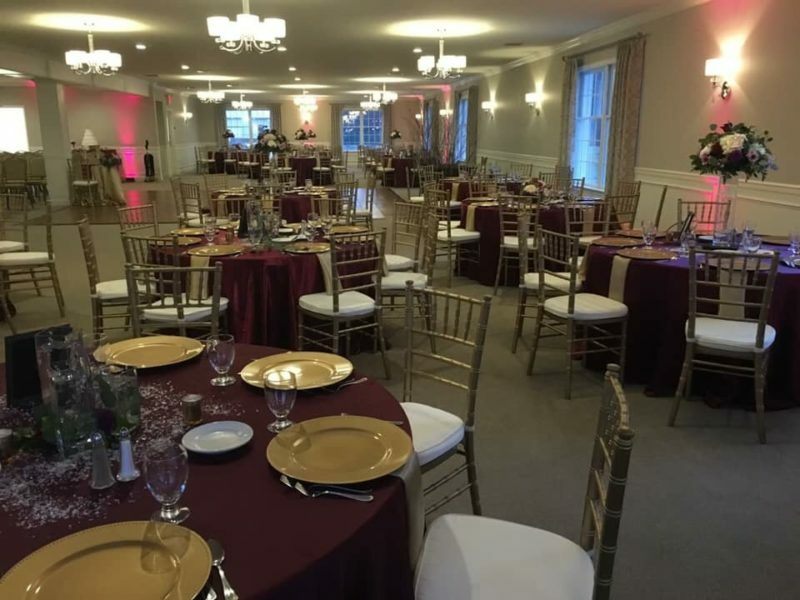 The bride’s brother, Chris, did an amazing job transforming the Ballroom into an elegant space with burgundy, gold and a rustic flair with accents of birch trees, candles and soft lighting. Kaitlyn and Mark got engaged in Disney World, and brought a little piece of Disney to their reception with their Disney inspired cake topper and seating chart. We absolutely loved their guest sign in, a large clock to sign that was set to midnight. At midnight the guests dawned their hats and horns and toasted the new year, along with the new Mr. and Mrs. Terray! Jared and Megan Hinkle celebrated their special day with us on January 19th and despite the snow, had a beautiful day surrounded by their closest friends and family! Their guests enjoyed a combination meal of Chicken Francaise and Beef Medallions and a delicious wooded themed cake from our very own pastry chef. Jared and Megan played “The Shoe Game” and ended their night with a sparkler send off, as their guests watched them drive away and leave for their honeymoon. Congratulations again and we wish you a lifetime of happiness!